Magical Bean-Lentil Chili | Good. Food. Stories. When the weather turns cold, I don’t fantasize about hot chocolate with marshmallows or Christmas cookies. 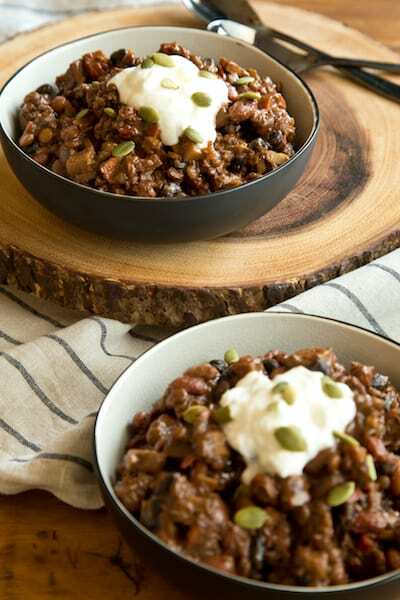 I fantasize about hearty, rustic chili, its flavor as dark and deep as a starless December night. Other soups and stews are all well and good, but there’s just something about chili that seems to invite people to grab a bowl, pull a chair up to the fire, and dig in. Perhaps because so many regions have distinct chili recipes, many of which date back more than a hundred years. Like most dishes that differ by region, the question of what is the most authentic chili is hotly contested, with some regions insisting that chili can’t contain beans while others swear it must, others contending that it have tomatoes while others swear it must not. The name for the dish is in reference to the chili pepper, and comes to us from the Nahuatl word, chīlli via the Spanish chile. The first chili was a mixture of dried meat, suet, and dried chili peppers, pounded together and dried—sort of like large chili bouillon cubes—so they could be reconstituted in boiling water by travellers. Chili entered the U.S. via Texas and spread from there, with each region staking a claim to the dish and making it their own, from Coney Island chili fries to Cincinnati chili that’s served over spaghetti to Hawaii’s chili rice. Now, I’ve made chili on hot plates, on stovetops, in slow cookers, and over a fire while winter camping (the most satisfying by far). I’ve made what feels like every variety of chili on the planet, with every combination of meat, beans, faux meat, and different flavor profiles. Hell, I even won a chili cook-off once. (That was actually incredibly awesome because the prize was a free ceramics class!) But I have finally, after years of wide-ranging chili flirtation, found my dream chili. 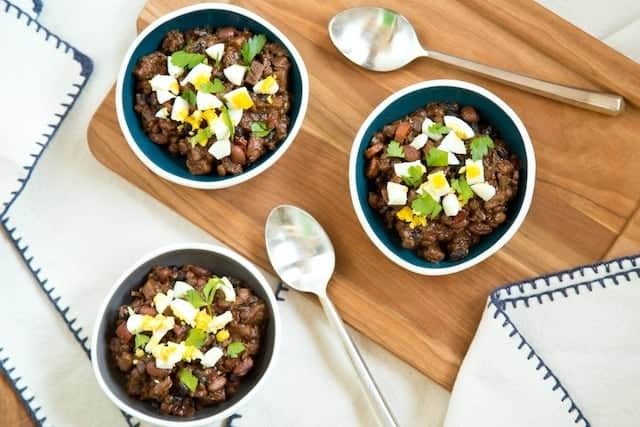 What makes this bean-lentil chili magical to me is that it doesn’t really … behave like chili. It has a different flavor profile than any I’ve ever made or eaten, and it’s one that makes it versatile in how I can repurpose it when eating it night after night. This chili is fragrant with cinnamon, cumin, and coriander that balance out the heat. It’s dark and intense from coffee and cocoa powder, smoky from bacon and bourbon, and gets its subtle sweetness from parsnips and a dash of maple syrup. Fragrant, spicy, dark, intense, smoky, sweet—to me, these are also the words that describe sitting before a blazing fire in a cabin, watching the snow fall gently outside, happy to be warm and safe. Now, the chili is great on its own and the flavors become deeper as it sits in your fridge. But I like to eat different things every day, so usually I’ll doctor each bowl up differently. Doing this, I can eat the same chili for a week of dinners and never get sick of it the way I do other leftovers. As a bonus, most of these toppings can be prepped in the five or so minutes that it takes you to heat up the chili! Omit the bacon and replace the bacon fat in the instructions below with olive oil to make this chili vegan. Soak the beans and lentils in water for at least 4 hours or up to 8 hours. While the beans and lentils soak, whisk the cocoa powder, cinnamon, cumin, thyme, coriander, chili powder, paprika, cayenne, pepper, and cardamom together in a small bowl. Whisk the maple syrup, mustard, bourbon, Worcestershire sauce, liquid smoke, and vinegar together in a separate bowl. Set both aside. Add the bacon to a large (6-8-quart) stockpot or Dutch oven and cook over medium-high heat until the bacon has rendered its fat and is crispy. Remove the bacon bits with tongs or a slotted spoon and let rest on a paper towel-lined plate. Stir the carrots, parsnips, onion, tomato, bell pepper, and chile pepper into the reserved bacon drippings in the pot and reduce the heat to medium. Cook, stirring occasionally, until the vegetables are just starting to soften, about 5 minutes. Stir in the garlic and cook for 1-2 minutes, then stir in the tomato paste and cook for 1-2 minutes more, stirring until the paste loosens up and coats the vegetables. Stir in the reserved dry spice blend and cook for 2-3 minutes, stirring occasionally. Drain the beans and lentils and add to the pot. Stir in the coffee and the reserved wet spice blend, then top off with enough water to cover the chili in the pot. Cover and bring the chili to a simmer, then uncover and cook for about an hour, adding more coffee or water if the beans and lentils are absorbing the liquid too quickly. Taste the beans after an hour to check their doneness; they should still be a bit toothsome and not quite there. Cook for another 30-45 minutes, until the beans are tender but not mushy or overcooked. Add the reserved bacon to the pot, along with any additional salt and pepper to your taste. Serve immediately, or refrigerate overnight to meld the flavors. The chili will keep for 1 week when refrigerated, or up to 3 months when frozen.